Jamal Lewis and Conor Hazard are the new faces in the Northern Ireland squad for the friendly against South Korea in Belfast later this month. 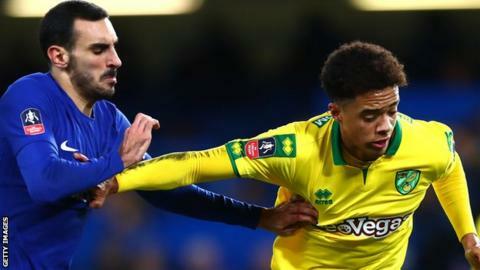 Norwich defender Lewis and goalkeeper Hazard, who is on loan at Falkirk from Celtic, are part of a 24-man party named by boss Michael O'Neill. West Brom midfielder Chris Brunt is taking a break from international football and misses the game. NI boss Michael O'Neill has urged Brunt not to make any hasty decisions. "I met Chris on Thursday, we had a good conversation," said O'Neill. "Chris is just - and I fully understand - he's just taking a break from international football at the minute and we'll discuss the situation [again]. "I said to him not to make any rash decisions too early and Chris won't do that anyway. "He has his own club situation to focus on at the minute, it's a difficult position that West Bromwich Albion are in at this minute in time so that dialogue will remain open and we'll see when September comes around where are his thoughts are then." In-form Wigan Athletic striker Will Grigg is another notable absentee after scoring seven goals in his last nine club games. O'Neill said on Monday that he, along with Wigan boss Paul Cook, believes it best that Grigg remains with his club as there are League One matches on the same date as the friendly. Queen's Park Rangers forward Paul Smyth also misses out as he will be with the U21s for their European qualifier against Spain. Lewis, 20, scored a dramatic last-gasp equaliser for Norwich in their FA Cup replay defeat by Chelsea in January. "Jamal has been in our U21s and injury deprived him in the first half of the season of playing more than he would have done for Ian Barraclough's team but his progress since coming back after injury has been phenomenal - he's basically played every game for Norwich. "I watched him play on a couple of occasions and it's great to have him in, a young player with huge potential and it's great that he's in and part of the senior squad." It will be O'Neill's first game since signing a new Northern Ireland contract last month. It will also be Northern Ireland's first match since their World Cup play-off defeat by Switzerland in November. Midfielders: Steven Davis (Southampton), Niall McGinn (Aberdeen), Oliver Norwood (Fulham on loan), Corry Evans (Blackburn Rovers), Shane Ferguson (Millwall), Stuart Dallas (Leeds United), George Saville (Millwall), Jordan Jones (Kilmarnock).